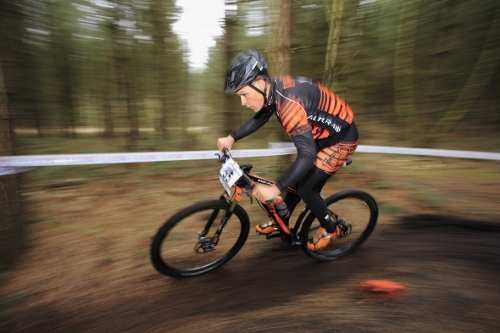 The last weekend of March saw the first round of the UK’s premier XC race – The British Cycling National Cross Country Series, get underway at Sherwood Pines in Nottingham. This was the first chance for the new 2015 team to really test themselves against the best. There was certainly a strong field, which consisting of the UK’s top riders and bolstered with talent from abroad. The wet and cold conditions on race day made it tough for the riders, but they all came through strong, putting in some solid performances. In the Women’s Elite race, Jo Clay was the first TORQ rider home putting in a respectable 11th place finish, followed shortly by new signing Jules Toone in 16th and Carla Haines in 21st. In the Elite Men’s race, a packed field of close to 60 riders saw Alex Welburn the first rider home in 29th, shortly followed by Chris Andrews in 32nd and Lee Gratton in 36th. In the Expert race, endurance specialist Richard Dunnett also put in a very strong performance, just off podium pace and finished in 4th place. Read on for each of the rider’s personal accounts of their races. Jo Clay – I couldn’t have felt much worse coming into the first National race of the season, I was terribly poorly with a cold, making it difficult to perform at my best. On the day of the race, I took a couple of Lemsips and hoped for the best. The weather was not on our side either, with heavy rain leading to deteriorating course conditions. Not that this bothered me as I love the mud! The women’s race had a very strong international field including Githa Michiels, Alice Barnes, Annie Last, Beth Crumpton, and Lucy Allan! My start wasn’t great, which is unusual for me, as I normally lead the field out. I thankfully didn’t panic and managed to pick riders off one by one. I found myself in a group of riders including my team mate Jules Toone, Catarina Ross and Ruby Miller, we battled for positions for the next couple of laps. I kept a good rhythm and slowly started to win the little battles. By the penultimate lap, Catarina and I had made a gap on Ruby and Jules and were catching Annie Simpson, who was a minute or so away. I then found some additional strength and managed to gap Catarina and catch Annie and pass her. This left me in a strong 11th place, so I just had to stay smooth and finish. The conditions by this time had got really bad and I couldn’t see much. It really was treacherous but I finished happy! Shame I had to be jet washed off at the end – which didn’t make me happy! Roll on summer!! The bike performed spectacularly and amazingly my new Altura kit has washed up lovely! Jules Toone – For my first race of the year, Sherwood didn’t quite go to plan. 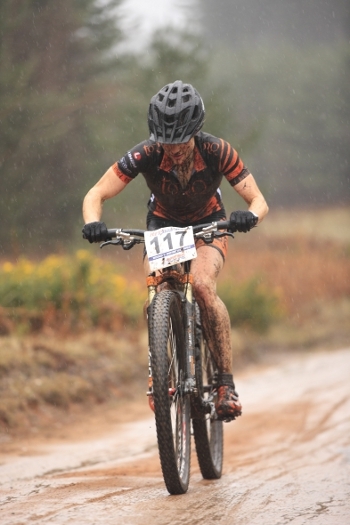 I hadn’t really anticipated the conditions, with persistent rain over the course of the race. As a result I suffered really badly with the cold and as the race went on I seemed to move further backwards. Towards the midpoint of the race, I stopped at the pits and had to be zipped into my Winter jacket, as I had really started to suffer. By that point, I was so cold that I couldn’t get going again and my performance ended up being compromised. I really enjoyed the course (in comparison to the previous couple of years), but am looking forward to putting this race behind me and seeing what I can achieve in some warmer and drier race conditions. Carla Haines – The first round for me didn’t go as well as I was hoping, but it was an insight to see where my fitness was compared to the last race. By the time Sunday came around it was miserable, raining and very windy. Preparation ran smoothly and I was warming up on the rollers in good time. On the start line, I felt like I wasn’t quite there. Usually I’m focused and ready to go, but I was sat up just waiting for the gun, relaxed rather than race ready. 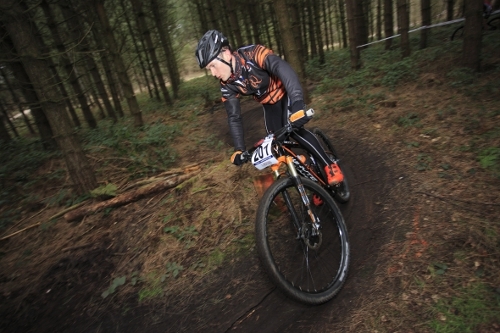 Lee Gratton – So TORQ fans, last weekend was the first National Series round at a not so sunny Sherwood Pines. The weather forecast didn’t look all that great, but compared to my last visit, when the track was knee deep in snow, it was an improvement! I couldn’t have planned my setup any better! I went with a Racing Ralph up front and a Thunderburt on the rear. I definitely got some stick for choosing a summer tyre on the back but it cut through the mud and slop a treat! Happy days! So down to the race. I didn’t get the best start, but once I got into the groove, I set about carving my trusty steed through the cyclocross-like mud! It was a great course and I really enjoyed the challenge. After 6 laps of solid graft, I made my way up to 32nd. That made me the 18th Brit, just behind the legend TORQ Fuelled Nick Craig. A result I am very happy with and a solid start to the season. 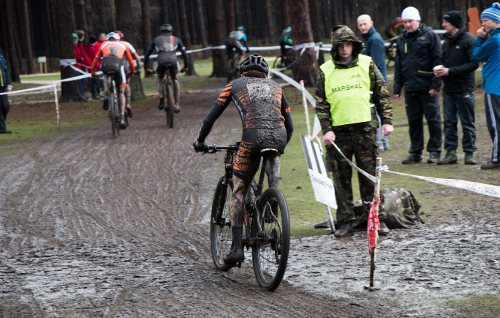 Chris Andrews – The first proper race of the year at Sherwood Pines was flat, fast and very muddy! The last one I wasn’t expecting! I’m not the best in these conditions, but I kept a positive attitude and from a grid position of 55th I could only move forward, which is thankfully exactly what I did. A good start put me into the top thirty and from there it was flat out. The conditions began to dry, which made racing very slow at times and on more than one occasion running was the only option. I rolled over the finish line in 32nd position. Not the best result, but in those conditions I will take it. Onto Plymouth for the second round of the Series, fingers crossed for some better weather. Alex Welburn – On practice, the course rode well and fast and had a very nice flow – with a few features in addition to last year’s course. The course was also backwards from last year. For the practice all was indeed very dry and fast. Sadly on the race morning this all changed. We were greeted with a constant down pour, despite this, I decided to stick with my 2.1 racing Ralph’s front and rear as I knew they would still do the job and roll lovely and fast. At the start of the race, the rider on the front (in my line) missed his pedal and did not start smoothly, which meant I lost a few positions very quickly and found myself in the latter half of the group. However, due to the conditions, riders were going down all the time, so thankfully over the next few laps, I moved up to around top 15. I had to take places where ever I could, however in hindsight, I got a bit too carried away and wasted energy when I didn’t necessarily need to. this I then paid for in the latter end of the race, as my legs slowly went and I lost a further few places, so finished around 29th. The form seems to be good based on the first ½ of the race, I just need to maintain it for the full duration and should attain some good results this year – which I’m very much looking forward to. Thank you to Phillipa Cassidy Photography for the first image and to Darren Ciolli-Leach of www.darrenciolloleach.com @XCPix for all the other images in this report.